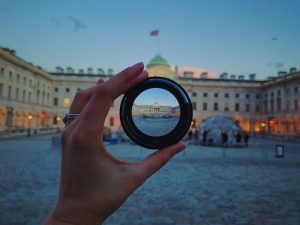 #ResFest is a night festival celebrating the connection and the collaboration between The Courtauld Institute and The Courtauld Gallery, both of which are part of Somerset House. The program includes lightning talks, performances, exhibits, bars and food trucks, and the overall goal of the event is to demonstrate how crucial art history is today. It’s a night where some of the best and brightest in the academic and cultural sectors ask big questions about the state of play in the art world, and how the future health of culture and society hinges on our ability to address and confront these questions head-on. I turn up at The Courtauld Institute and get my bearings. There’s a real mix of people waiting in line, which is great to see. 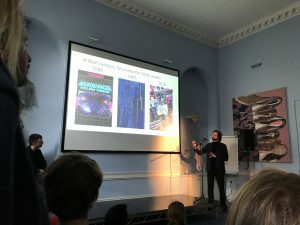 I happily collect my cocktail and navigate to the first talk, which is by PhD candidate and Associate Lecturer Boris Čučković Berger exploring what art historians can see beyond the digital code. He speaks about how ‘digital’ has become a figure of speech and considers what impact this has on artists and organisations today, suggesting that digital production and contemporary art has shifted from metaphor to metonym. This is pretty deep stuff to cover in just 15 minutes but he gives it a red-hot go! 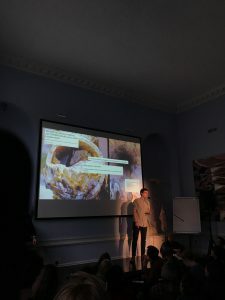 Next up is Edwin Coomasaru’s hotly anticipated talk on whether the Museum of London Fatberg is a metaphor for Brexit, which you can read about in his recent article for The Irish Times. I’ve only just discovered what a fatberg is and have been a bit behind the times on the Brexit situation. But, after Coomasaru’s talk, I’m now (grossly) more informed on how both Leavers and Remainer use the Gothic metaphor of excrement in discussing Brexit, and what this reveals about the human psyche. All the people show up to hear Anna Liesching ask ‘Where are all the women?”. Anna is Assistant Art Curator for the Ulster Museum, and she has me at “we need to construct a more inclusive history”. 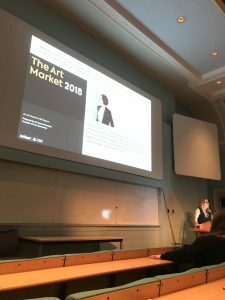 She talks about her research into women in art and how contemporary academics need to approach research from a different perspective to unmask and bring female artists into the light. It’s a sign that I’m captivated when I realise that it’s been over an hour and a half since I arrived and I haven’t finished my drink yet! I wander downstairs and head to Upper Terrace to check out the food trucks. I grab some delicious fried chicken from Mother Clucker and enjoy the stunning sunset against the backdrop of Somerset House. I feel bad not going to explore the gallery spaces, but I figure that I’ll have time to do that another day, whereas I won’t necessarily be able to check out the live performances and talks. I wander down to the Student Café where there is a rocking live band and several people hanging around from the end of the Big Art History Pub Quiz. It’s a great atmosphere and awesome to see people enjoying themselves. I sneak in late to food historian Tasha Marks’ presentation on how to make museums more sensory. Her organisation AVM Curiosities has run amazing projects with institutions like the V&A, the British Museum and the Barbican to make everyday actions like eating toast into performance pieces. She argues that sensory experiences are a vital way to enable people with disabilities to meaningfully engage with cultural institutions, but that integrating touch, taste, sound, sight and smell can create surprising and exciting meaning for all audiences. The night is drawing to a close, so I climb the stairs to my final talk for the evening. Founder of private art consultancy SFA Advisory Lisa Schiff is posing whether we can bridge the gap between the academy and the market. She talks about the impact of business and commerce on the cultural sector and draws attention to how donors are increasingly influencing content, what is exhibited, and how. She raises some interesting points about the future of museums and galleries in this respect. It’s been a cracker of an evening, and I’ve really enjoyed the overall vibe of the night and the style of presentations. I’d happily listen to all of the speakers for much longer than 15 minutes, but the style of lightning talks is a great way to condense massive ideas into bite-sized, questioning sessions. I come away from the evening pondering some new perspectives on art history, and I’m excited to come back and explore the Courtauld Gallery again soon.